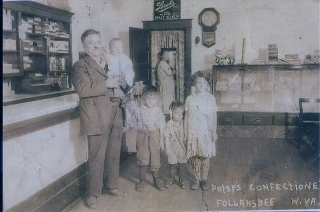 Patsy’s Confectionery was located at 558 Main near the corner of State & Main Streets. Pasquale (Patsy) is up front and his wife Marie in rear. Photo courtesy of Mary Jo Boniey. Follansbee Review, “The Brightest in the Galaxy,” March 30, 1916 Follansbee Review, “Thirty Nations Represented …,” July 28, 1916.